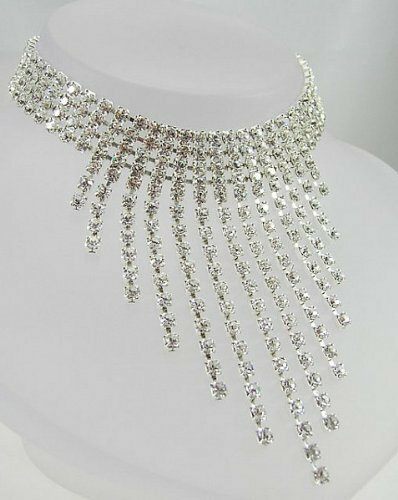 A striking and impressive diamante choker. This piece has 13 graduated drops of claw set Swarovski crystal set onto a four row choker. 310 mm long (excluding 70mm extender chain) x 105mm wide. 1/2 micron 22ct Hard Gold or Silver plated. Presented in a luxury leatherette box. Hand made in the UK using the highest quality components and genuine Swarovski Crystals. At LJ Designs and Oaks Jewelry we take great pride creating our jewellery. Beautifully finished and carefully inspected to ensure perfect quality every time. Packaged with care in a luxury jewellery box to make a stunning ladies present. If you have any questions about this product by LJ Designs, contact us by completing and submitting the form below. If you are looking for a specif part number, please include it with your message.